This is just a quick note to test the e-mail subscription feature for the site. When we moved servers last week, we couldn’t immediately move the subscriber list with us. That meant we went from more than 2,000 e-mail subscriptions down to zero. Some people have signed up since then. Today I think we finally solved the problem of transferring the old e-mail addresses from our original server, so our subscriber list is back up over 2,000. But I’m not 100 percent sure what will happen if you signed up in the last week. You may have noticed that we’ve had some server issues over the last six months. The thing is, we became really popular, really quickly. And that’s a good thing—just not when you’re trying to keep the site running and bad weather hits and the site dies. Fortunately, I think we’ve solved the issues. We’ve moved the site to a new server. We have lots of memory, cache, storage, and all kinds of other resources I think we’re going to need. I think. If you subscribed by e-mail, we haven’t migrated users over to the new server yet. I’m hoping to address this in the next 24 to 48 hours. We have a plan. I think it will work. If it doesn’t work, or if you want to make sure you don’t miss anything, you can subscribe now in the “Subscribe via e-mail” box to the right of this post. Thank you to all of our readers for your patience and forbearance. If it’s been frustrating for you, believe me, it’s been ten-fold for us. 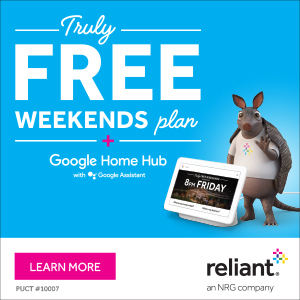 Note: This is the second in our series of posts sponsored by Reliant. They’re covering our site for the entire 2017 Atlantic hurricane season, and in return we’re writing a handful of posts that highlight their services to readers. Today’s post concerns air conditioning efficiency and other tips to keep you (somewhat) cool this summer. Houston has had an easy slide into summer this year, as we haven’t yet reached the upper 90s. But we all know what’s coming later in July and August, and the time to make sure your home and AC are prepared for deep summer heat is now. (Last year’s first 100-degree day came on July 23). The last thing you want is your AC to go out on the hottest day of the year. Take control of your costs by following the four-by-four principle for your AC. Set your thermostat four degrees higher when you’re away from home for more than four hours to help reduce electricity usage and costs. 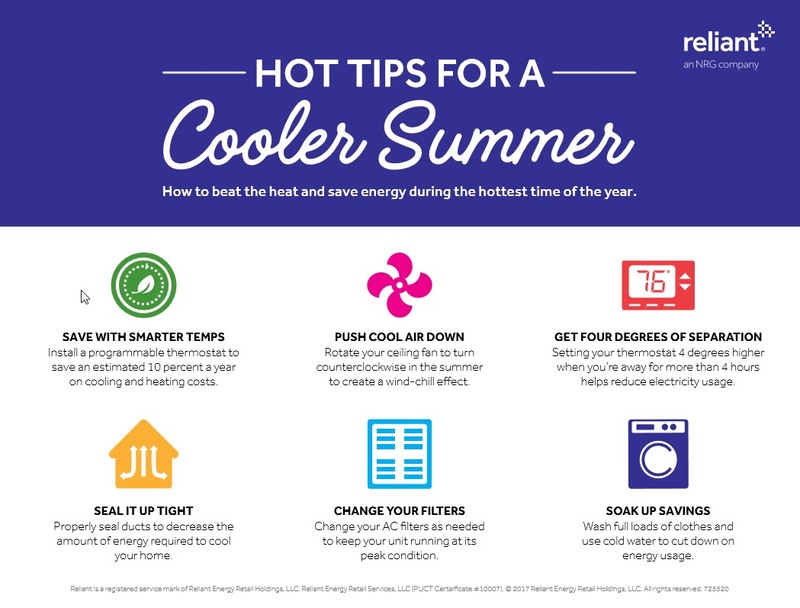 When your thermostat is set below 78 degrees, each degree cooler can increase your costs by up to seven percent. Switch your ceiling fan to turn counter-clockwise during the summer months to create a wind chill effect when coupled with cool air from your AC, for a more comfortable living environment. However, remember to turn off fans when you leave the room. Fans are for people—not for rooms. Resist the urge to override your automatic AC fan settings. Set your AC fan to the “auto” rather than “on” position. The “on” setting can increase energy costs and cause heat from the attic to transfer into your living space through the ductwork, making the AC work harder to maintain your desired temperature. Use a programmable thermostat. It will automatically adjust the temperature to fit your schedule and conserve energy, not to mention help prevent mold that thrives in hotter, humid temperatures. Replacing filters regularly helps your system operate more efficiently and can prolong the life of your AC equipment. Reliant even delivers AC filters right to your door with Reliant Filters Made Easy, one less item for your checklist. Also, while changing your filters, be sure and check that you’re not obstructing the return air vents with furniture, or other items. A house without enough insulation can lose up to 40 percent of cooled air, and more than 80 percent of homes built prior to 1980 do not have enough insulation. This is the most cost-effective home improvement that can be made, as conventional insulation is relatively inexpensive. Reliant’s home services, which are available to everyone, not just Reliant customers, to help keep you comfortable. They service air conditioning, heating (admittedly, probably not a priority right now), plumbing, electrical and more. During an AC checkup a licensed HVAC professional checks multiple points in your system, and inspects all components and parts and find out if you’re getting enough cool air to rooms. Welcome to the beginning of the 2017 Atlantic hurricane season! This year I’m thrilled to announce that Space City Weather has teamed up with an Extreme Weather Partner, Reliant, for the entire six-month season. And that’s a good thing, because although we don’t put too much stock into seasonal forecasts, there are some reasons to believe this season may be fairly active across the Atlantic Ocean, Gulf of Mexico, and Caribbean Sea. As part of our agreement, Matt and I will be writing a handful of posts during the next six months about extreme weather, and some of the options residents have to prepare for hurricanes, power outages, and other weather-related problems that can arise in Houston. Beginning with this one, these will clearly be marked as sponsored posts, but will be written by us, for you. To kick off hurricane season, we’re going to delve into the topic of power outages and generators. Aside from life-threatening hazards and damage to one’s home or business, outages are among the most significant inconveniences during inclement weather. Anyone who lived in Houston during the aftermath of Hurricane Ike will know this well. Outages can be dangerous, too, as people sometimes attempt to operate gasoline-powered generators indoors, or take other extreme measures. When the power goes out, thanks to the Internet, it is now easy to report the outage and get an update on when service is most likely to be restored. For most of Houston, the “poles and wires” infrastructure that delivers power to customers is CenterPoint Energy. They are the conduit for power provided by retail electricity providers like Reliant.